Columbia, Mo. (Nov. 10, 2015) — Confrontations between journalists and protesters at the University of Missouri on Nov. 9 provide important opportunities to discuss the First Amendment, according to Missouri School of Journalism professors Brett Johnson and Stacey Woelfel. University of Missouri System President Tim Wolfe and University of Missouri-Columbia Chancellor R. Bowen Loftin both resigned on Nov. 9 after complaints and protests of their leadership. The boundaries of freedoms of speech, press, assembly, religion, and petitioning against the government for grievances were brought to the forefront during a protest on Carnahan Quad. 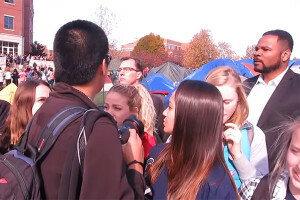 A video taken during the protest appeared to show a faculty member from the College of Arts and Science dealing aggressively with student journalists. This individual also has a courtesy appointment in the Missouri School of Journalism but has never had a teaching role. Update Nov. 11, 2015: This individual resigned her courtesy appointment with the Missouri School of Journalism. She never taught courses at the School. Johnson and Woelfel identified key First Amendment issues highlighted by this incident that are especially relevant in an educational setting. Regardless of what reporters’ First Amendment rights may be, they should always use good ethical judgment. The legal and ethical considerations are best understood after viewing the video. These points can be used to enhance discussions in journalism programs and newsrooms across the country. Regarding an expectation of privacy in a public space, it’s clear that the entire quad (or the area inside the human circle) could not be declared to be private. But the space inside the tents of the protestors, walled off out of sight, can be considered a private space, even though they were set up in the middle of a public space. The protestors could have reasonably expected to have privacy inside the confines of the tents, protecting them from members of the news media. The ring of students and others used to hold back the media can be seen in two ways. The circle appeared to have been made up of students and individuals acting as private citizens and not as agents of the university or other government entities. Therefore, their human circle was not a violation of the First Amendment rights of the media. It could be argued that the human circle was the expressive speech of the people assembled. On the other hand, others might say the human circle was unprotected conduct intended to create a media-free zone, thus denying members of the press their First Amendment right to gather information in a public place. Had neutral parties been present, they could have made the distinction between whether or not the human circle was protected speech or unprotected conduct. The School instructs its students who are working as journalists for its news outlets not to be participants in the events they cover. Missouri journalism students have a responsibility to be above reproach and to consider their actions in every situation. Some students had to make personal choices regarding their participation in this event. A broader question looks at the value to the protesters of excluding the media in the Carnahan Quad area. Many groups use social media to control their own messages. Bypassing the news media may not be the best long-term strategy. The threat of violence in the video against the reporters is troubling. The threat may have derived from a crowd mentality that seemed to come into play at the scene or might have been influenced by an earlier physical encounter between one of the university officials and a non-student member of the press. Regardless of the situation, there are laws protecting all citizens from true threats and physical violence. Contact Johnson or Woelfel with questions and comments about these key First Amendment issues.